HD-SDI Express video capture card can acquire single or multiple images from any SD or HD SDI video source and send them to ExpressCard/54-compliant notebook computer at greater than 235 MBps. Along with support for plug-and-play operation with live insertion and removal, features include lookup tables, histograms, and hex pixel dumps. Card offers 75 W BNC coaxial connector that can accept analog SMPTE 292M serial signal operating at speeds to 1.486 Gbps, with 274M and 296M framing. BOCA RATON, FL - February 26, 2009 - Imperx, Inc. a leading provider of state-of-the-art digital cameras and frame grabbers, is bringing professional vision system video capture to ExpressCard/54 laptop computers. The company's newly-released HD-SDI Express video capture card is a highly versatile frame grabber capable of acquiring images from any standard definition (SD) or high definition (HD) SDI video source and sending them to an ExpressCard/54-compliant notebook computer at more than 235 Mbytes/sec for real-time viewing and storage. The card supports plug-and-play operation with live insertion and removal and incorporates advanced features such as lookup tables and histograms. 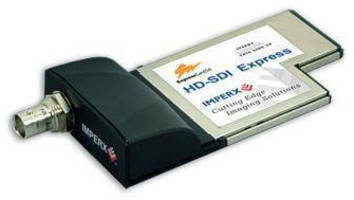 Imperx's introduction of the HD-SDI Express card leverages the company's expertise developing PCMCIA frame grabbers. "The success of our FrameLink and VCE series combined with this new introduction has positioned Imperx as the world's leading supplier of frame grabbers for laptops," said Imperx president Petko Dinev. "These products provide the functionality, performance, and versatility required by today's most demanding vision systems." The HD-SDI Express card offers a 75-ohm BNC coaxial connector that can accept an analog SMPTE 292M serial signal operating at speeds to 1.486 Gbits/sec, with 274M and 296M framing. It accepts SD and HD SDI video formats for 720p, 1080i, and 1080p resolution and saves images in 20-bit YCrCb 4:2:2 or 24-bit RGB formats. The card can capture single or multiple frames at full resolution as well as generate standard AVI clips, and can stamp captured frames with date and time as well as a user-defined message. Both normal and delay capture modes are available. In addition to raw data the card can output files in BMP, TIFF, or adjustable JPEG file formats. Users can make system adjustments such as window size, brightness, RGB gain and offset and automatic white balancing. The card also incorporates several advanced features, including lookup tables, histogramming, and hex pixel dumps. Interface to the laptop host is ExpressCard/54-compliant and uses a x1 PCIExpress link to achieve 2.5 Gbits/sec bandwidth. The connection supports plug-and-play operation along with live insertion and removal. To maximize bandwidth utilization efficiency, the card implements intelligent scatter/gather DMA and a flow-through pipelined architecture ensures low latency. Throughput exceeds 235 Mbytes/sec. The HD-SDI Express comes with easy-to-use camera configuration software that allows for rapid integration of the card into demanding machine vision environments along with applications programs such as an image viewer with DVR controls. It also has full-featured GUI drivers for Windows XP/2000/Vista, DirectX, TWAIN, Labview, and Matlab. The software development kit (SDK) supports C/C++, COM, .NET, and ActiveX all with samples and source code. Ordering information for the HD-SDI Express video capture card can be obtained by contacting sales@imperx.com. Products will begin shipping in mid-February. Imperx, Inc. designs, develops and manufactures advanced imaging products used in the machine vision, medical, defense, surveillance and astronomy markets, and wherever there is a need to capture high-resolution digital color or black/white images for both still and full-rate motion processing. Headquartered in Boca Raton, FL, with distributors nationwide, Imperx has manufacturing facilities that are certified for ISO 9002 compliance. 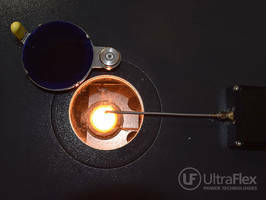 For more information, visit the Imperx, Inc. website at www.imperx.com.